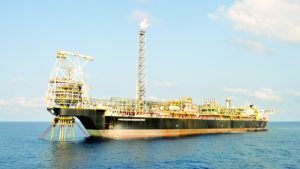 Tullow Oil plc has said the mooring of Ghana’s second FPSO has been done. FPSO Prof. John Evans Atta Mills sailed from Singapore on 23 January and arrived in Ghanaian waters on 2 March. It will be used for production in the TEN fields. The project is now over 90 per cent complete and during the first-quarter of 2016, a number of significant milestones have been achieved, Tullow reported. Following the successful mooring of the FPSO, the vessel is now being connected to the subsea infrastructure via the risers and umbilicals and the commissioning of these systems is under way. Six of the eleven pre-drilled wells are now completed, with the seventh completion under way. The overall subsea installation campaign, comprising approximately 35,000 tonnes of equipment, has also reached over 90 per cent completion. Given the mid-year start-up and ramp-up in the second half, Tullow said it estimates that TEN average annualised production in 2016 will be around 23,000 bopd gross (net: 11,000 bopd) as previously guided. This statement is issued in advance of the Group’s Annual General Meeting which is being held at Tullow Oil plc, Building 9 Chiswick Park at 12pm today. The Group will announce its Trading Statement and Operational Update on 30 June 2016. Half year results will be announced on 27 July 2016. • Group working interest production for the first-quarter averaged 59,200 bopd for West Africa and 6,500 boepd for Europe. This was marginally below expectations due to the need to implement new Jubilee off-take procedures at the end of March following damage to the Jubilee FPSO turret bearing. • New Jubilee off-take procedures being implemented with off-take and production to resume in the next few days. Group production guidance will be re-issued once new operating arrangements have stabilised. No material impact on future Group cash flow is currently expected due to continued production and appropriate insurance policies in place. • The TEN Project is now over 90 per cent complete and first oil remains on target for July/August 2016. • East Africa Governments agreed to develop resources in Uganda and Kenya with separate export pipelines. • Ongoing assessment of recently completed South Lokichar appraisal programme in Kenya indicates potential to increase recoverable resources up to 750 million barrels with further exploration potential supporting an upside of 1 billion barrels. • Working hydrocarbon system discovered with the Cheptuket-1 exploration well in Kenya’s Kerio Valley Basin. • Routine six-monthly Reserve Based Lending redetermination process completed. Debt capacity of $3.5 billion secured. • Revolving Corporate Facility extended by 12 months to April 2018, with an initial committed amount of $800 million as of April 2017. An accordion feature has been agreed with Lenders for an additional amount of $200 million. • End of April net debt estimated to be c.$4.5 billion and unutilised debt capacity and free cash of c.$1.3 billion. Capex guidance for full year 2016 revised down by c.$0.1 billion to c.$1.0 billion with further savings expected. Working interest oil production in West Africa averaged 59,200 bopd for the first quarter 2016. The Group’s portfolio of non-operated assets continued to perform well over the period with production in line with expectations. Jubilee production was below expectations due to increased downtime associated with the implementation of revised operating procedures following a problem being identified with the FPSO turret bearing. In light of this issue, full-year 2016 average working interest production is likely to be below current guidance of 73-80,000 bopd and updated guidance will be provided when the new operating procedures have been fully implemented and stabilised. However, Tullow does not currently expect this issue to have a material impact on future cash flow, due to the imminent resumption of production and appropriate insurance policies in place. A technical investigation of the Jubilee FPSO turret bearing has confirmed that it is no longer able to rotate as originally designed leading to new operating procedures being implemented. These include the vessel being put on “heading control” which requires the use of tugs to minimise vessel rotation and revised offtake procedures, including the use of a dynamically-positioned shuttle tanker and a storage tanker. Revised operating procedures are being implemented at the Jubilee field with new equipment and approvals in place. Sea water injection resumed on 23 April 2016 and offtake is expected to re-commence in the next few days with production to follow shortly thereafter. These activities and the two week planned maintenance shutdown have impacted gross production from the Jubilee field which averaged 80,300 bopd (28,500 bopd net), for the first quarter 2016. A project team has been established to review the root cause of the problem and determine the optimum design of the permanent solution of the Jubilee turret issue. A decision on the solution is expected in the next few months. Tullow has a comprehensive package of insurances in place, including Hull and Machinery insurance, procured on behalf of the Joint Venture which covers relevant operating and capital costs associated with damage to the FPSO, and Business Interruption insurance which covers consequent loss of production and revenue. Claims under both policies have been notified to our insurers. The TEN Project is making excellent progress and remains within budget and on schedule with first oil expected between July and August 2016. The project is now over 90 per cent complete and during the first quarter of 2016 a number of significant milestones have been achieved. 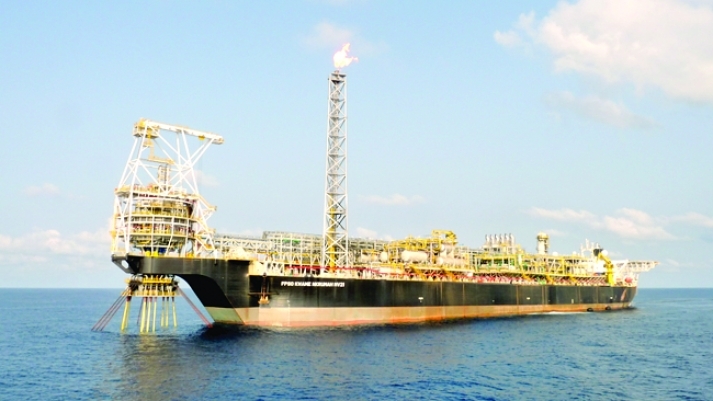 The FPSO Prof. John Atta Mills sailed from Singapore on 23 January and arrived in Ghanaian waters on 2 March. The FPSO mooring operations are complete, the vessel is now being connected to the subsea infrastructure via the risers and umbilicals and the commissioning of these systems is under way. Six of the eleven pre-drilled wells are now completed, with the seventh completion under way. The overall subsea installation campaign, comprising approximately 35,000 tonnes of equipment, has also reached over 90 per cent completion. Given the mid-year start-up and ramp-up in the second half, Tullow estimates that TEN average annualised production in 2016 will be around 23,000 bopd gross (net: 11,000 bopd) as previously guided. In Europe, average working interest gas production for the first quarter 2016 is in line with expectations at 6,500 boepd with the Group’s portfolio of non-operated assets performing well. In Kenya, the result from the basin opening Cheptuket-1 well in the Kerio Valley Basin was announced in March. The well encountered good oil shows, seen in cuttings and rotary sidewall cores, across an interval of over 700 metres and post-well analysis is still in progress. Following this encouraging basin opening well and the successful Etom-2 result in the South Lokichar Basin in December 2015, further exploration activities are being evaluated. At a meeting between various East African Governments in Kampala on 23 April 2016, it was agreed that Uganda and Kenya would develop separate, standalone export pipelines for their oil resources. Tullow welcomes the clarity and certainty that this decision brings. In Uganda, Tullow will now work with the Government of Uganda and our partners on the development of these significant resources through a Uganda-Tanzania pipeline. In Kenya, the Group continues to examine the data from its recently concluded appraisal campaign and our initial assessment indicates recoverable resources of up to 750 million barrels of oil in the South Lokichar Basin. The Group continues to review options for re-starting the exploration campaign in this basin to de-risk the overall upside potential of 1 billion barrels. Tullow will now work with the Government of Kenya and our partners on a range of options for the independent development of these resources including early production using existing infrastructure which would provide valuable reservoir data ahead of a full field development with an export pipeline. In Norway, drilling of the Wisting Central 2 long reach horizontal well in the Barents Sea was completed in early April and successfully explored and appraised the Wisting South & Wisting West segments of the field and included a production test in the Stø formation. The well was drilled approximately 5 kilometres south-west of the Wisting discovery well. The well encountered an oil column of 22 metres in a 1,402 metres horizontal section with 1,250 metres of net light oil pay. A constrained production test was carried out with a flow rate of approximately 5,000 boepd demonstrating excellent reservoir properties and valuable development potential. The well results are expected to provide an increase of in-place volumes. The next operated well planned in Norway is on the Rome prospect in PL776, which is expected to commence in July 2016. In Jamaica, a 2D seismic survey has been completed over the 32,056 sq km Walton Morant licence. The results of the survey are currently being analysed to delineate potential plays in shallow water. In February 2016, Tullow farmed down a 35% working interest in Block 15 in Uruguay to Statoil with government approval expected shortly. Tullow and its lending banks have completed the routine six-monthly Reserve Based Lending (RBL) redetermination process and agreed a twelve month extension to the maturity of the corporate facility. Tullow secured available debt capacity of US$3.5 billion under the RBL and Tullow’s lending banks also agreed a further amendment to the financial covenant on the RBL and the Corporate Facility. The first amortisation of the RBL is scheduled in October 2016, when commitments will reduce to $3.25bn. The Corporate Facility has been extended to April 2018. The current commitments in April 2017 are $800 million and an accordion feature has been agreed with Lenders for an additional amount of $200 million. These successful banking outcomes demonstrate the continued support of the Group’s lending banks during this period of low oil prices and the high quality of Tullow’s asset portfolio. The business remains well funded and at the end of April 2016, net debt is estimated at approximately $4.5 billion and unutilised debt capacity and free cash at approximately $1.3 billion. The Group’s 2016 forecast capital expenditure has been reduced from $1.1 billion to $1.0 billion following the identification of savings across the portfolio with further reductions expected.